Documentation is an important consideration of professional chaplaincy practice. It has become increasingly so as more health care institutions convert to electronic medical records. However, there are challenges to chaplaincy documentation that are different from those of other health care disciplines. Many chaplains feel under-prepared to meet these challenges. This program is designed to examine the issues related to the effective practice of chaplaincy documentation. 1. Understand the who, what, where, when, how and why of chaplaincy documentation. 2. Examine two models for chaplaincy documentation. 3. 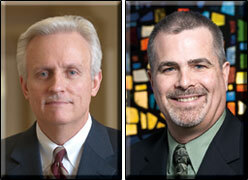 Learn some of the legal considerations and potential problems of chaplaincy documentation. Brent Peery DMin BCC is the director of Chaplaincy Services at Memorial Hermann - Texas Medical Center in Houston, TX. For the past five years, he has served as a chaplaincy consultant/subject matter expert for the United States Navy Bureau of Medicine and Surgery in Washington, DC. He is interested in writing, research and teaching about the work of professional chaplains in order to advance the important work we do. He served on the committee that authored Standards of Practice for Professional Chaplains in Acute Care Settings and currently serves on the Quality Committee of APC. Greg King JD is an attorney and partner in the Louisville offices of Stoll Keenon Ogden. A graduate of the University of Kentucky College of Law, Greg's practice is dedicated almost exclusively to the defense of professional negligence actions, with emphasis upon physician, nursing and hospital malpractice. He is a frequent lecturer on related subjects, and a previous adjunct professor at the University of Louisville School of Law, teaching the law of medical malpractice. Greg is a past president of the Louisville Bar Association, is certified by the National Board of Trial Advocacy, and has been elected to both Best Lawyers in America and Top Lawyers in Louisville.